Mr. Tremblay is the Senior Managing Director, Portfolio Management & Operations, responsible for portfolio management globally and the operations of the organization. Mr. Tremblay is a member of Lone Star’s Executive Management Committee. Mr. Tremblay has over 17 years of experience in portfolio acquisitions and asset management. Prior to Lone Star, Mr. Tremblay was Managing Director, Global Head of Portfolio Management at Hudson where he had oversight of groups including Global Portfolio Management, Global Markets, Global Insurance and Global Cash Management. During his seven year tenure with Hudson, he held several positions across the organization including roles of increasing responsibility in portfolio management as well as underwriting. Before joining Hudson and Lone Star, Mr. Tremblay was a Partner at Capital Square L.P., a real estate consulting and brokerage firm involved in all asset classes; Director–Business Development at Maestro L.P., a fund manager specializing in residential real estate; and an Asset Manager for CDP Capital – Real Estate (Cadim Inc.). 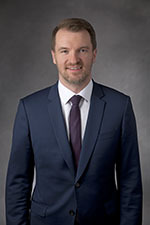 Mr. Tremblay holds a Bachelor’s degree in Urban Planning from Université de Montréal and an M.B.A. degree in Real Estate from Université du Québec à Montréal.